Some handy tips from our friends at Debco on Renovating your lawn!! If lawn is a significant part of your garden, then caring for it is an important part of garden maintenance. A well-tended lawn sets off the rest of a garden and offers the perfect foil for many ornamental plants. Lawns are thirsty, so where water is short you may want to limit the extent of your lawn. Autumn is the perfect time to renovate a lawn. There are a number of steps in lawn renovation, including scarifying, coring, top-dressing and repairing. Look closely at your lawn and you will probably see a layer of thatch on the surface of the soil at the base of the leaf blades of the grasses. Thatch comprises decaying blades of grass as well as moss and other detritus. If allowed to thicken, it can prevent movement of air to the soil surface, reduce water penetration into the soil (indeed it may repel water!) and could inhibit the spread of grass, resulting in a thinner lawn. Scarifying is the process of thinning out this layer of thatch. A thin layer of thatch acts as a welcome mulch, reducing water loss and inhibiting weed germination. On small lawns, thatch can be removed by vigorous raking with a wire or spring-tined rake. But this is hard work. For larger areas hire a powered scarifier and scarify the lawn in two directions at 90° for maximum effect. Where lawns are heavily trampled, for example where children play, it would be beneficial to aerate the lawn by coring to stimulate root growth. This is best done with a corer or hollow tine machine. A series of cores are removed from the lawn, about 10mm in diameter and about 100mm apart. If your lawn is small, you could even use a garden fork. But watch out for your watering system! These holes can now be filled with a more open soil. Apply a soil top dressing in dry weather, spreading it over the surface at a rate of two kg per square metre. 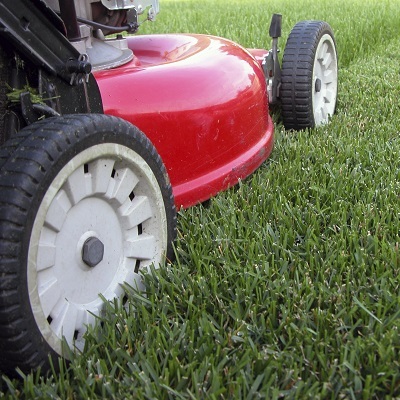 Brush the lawn with a stiff brush to fill the cores in the lawn surface. Air and water can then flow into the soil, resulting in improved grass growth. Make sure that the top dressing does not smother the grass. Where damage consists of worn patches, then more dramatic repair will be required. If the lawn wear is extreme then a new lawn may need to be formed. Patches often result from trampling and this may cause compaction of the soil. A good starting point for these repairs is to cut out the turf to a rectangular shape, forking over the soil to open it up, thus overcoming compaction. If the soil is clay, apply gypsum and dig in some organic material. Apply SaturAid to improve water penetration. Select lawn seed that matches the existing lawn and lightly sow grass seed on the exposed soil surface. Protect the grass surface to ensure that birds do not eat the seed and keep it well watered to ensure good germination. Avoid further wear until your new grass seedlings have taken hold.